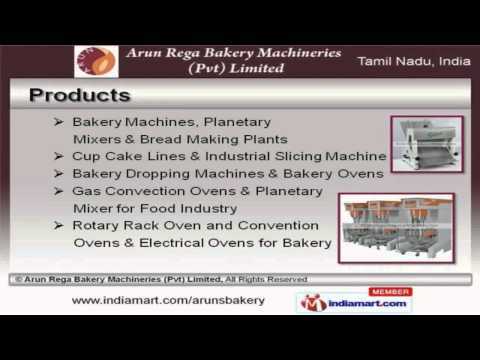 Welcome to Arun Rega Bakery Machineries Private Limited, Manufacturer and Exporter of Bakery Machines and Equipments. The company was incorporated in 2002 at Coimbatore. International quality standards and CAD/CAM facility helps us to grab maximum customer satisfaction. Assured quality products, excellent customization facility and Industry leading prices make us the first choice of our clients. We offer a wide assortment of Bakery Machines, Gas Convection Ovens and Planetary Mixer for Food Industry. Our Bakery Machines, Planetary Mixers and Bread Making Plants are best in the industry amongst others. Cup Cake Lines and Industrial Slicing Machine are well known for their durability. We are one of the trusted names of the industry engaged in offering genuine quality Bakery Dropping Machines and Bakery Ovens. We are instrumental in offering a high quality range of Gas Convection Ovens and Planetary Mixer for Food Industry. We are known in the industry as the manufacturer of Rotary Rack Oven and Convention Ovens and Electrical Ovens for Bakery.